The new commemorative Danish stamps issued during this period feature the Danish monarchy, important events and people in Danish history, Danish churches, and two philatelic exhibitions. The four commemorative Danish stamps shown above (Sc. #258-261) were issued on May 15, 1937 to celebrate the 25th Anniversary of the Reign of King Christian X. The 5 Ø., 10 Ø., and 15 Ø. denominations were also issued in booklets. The three common designs are as follows. Yacht and Summer Palace at Marselisborg. King Christian X riding through the streets of Copenhagen. Statue of King Frederik V and Amalienborg Palace. The overprinted 5 Ø. denomination stamp shown above (Sc. #263) was issued on September 2, 1938 to publicize the 10th Danish Philatelic Exhibition. These stamps were issued in panes with the overprints on alternate stamps. They are usually collected in pairs, strips, or blocks, showing the alternating overprints. The three Danish stamps shown above (Sc. #264-266) were issued on November 17, 1938 to commemorate the 100th Anniversary of Bertel Thorvaldsen's Return to Denmark. The two common designs feature an 1837 painting of Bertel Thorvaldsen and Bertel Thorvaldsen's 1803 masterpiece, "Jason with the Golden Fleece". Bertel Thorvaldsen (1770-1844) was an internationally known Neoclassical sculptor from Denmark. He spent much of his professional life studying and working in Italy. When he returned to Denmark in 1838, he was received as a national hero. During his life, he was regarded as the successor to the master Italian sculptor, Antonio Canova. 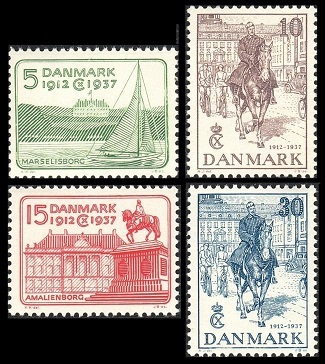 The three pictorial Danish stamps shown above (Sc. 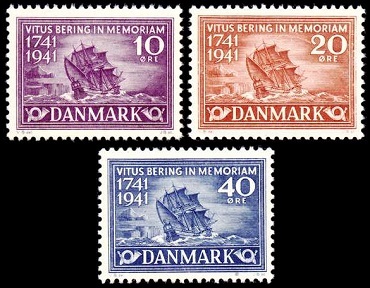 #277-279) were issued on November 27, 1941 to commemorate the 200th Anniversary of the Death of Vitus Bering. The common design features an artist's interpretation of Vitus Bering's ship, "The St. Peter". Vitus Jonassen Bering (1681-1741), a.k.a. Ivan Ivanovich Bering, was a Danish cartographer and explorer in the service of the Russian Empire. As a Captain in the Russian Imperial Navy, Bering was chosen to lead an expedition, in 1725, to map the Kamchatka Peninsula and to establish whether or not Asia and North America shared a land border. His expedition established that there was a sea between Asia and North America. Bering set out on his second expedition, to explore North America, in 1741. During his second expedition, Mt. Saint Elias (in Alaska) and Kodiak Island were sighted, and a landing was made at Kayak Island, off the Southern coast of Alaska. Later on, Bering also mapped some of the Aleutian Islands. Bering became very ill on the return trip, and his ship was forced to seek refuge at an uninhabited island of the Commander Islands group in the Southwestern portion of what is now the Bering Sea. Bering and twenty-eight of his crew members were buried on the island which now bears his name. The Bering Strait, Bering Sea, Bering Island, Bering Glacier, and Bering Land Bridge were all named in his honor. The three pictorial commemorative Danish stamps shown above (Sc. 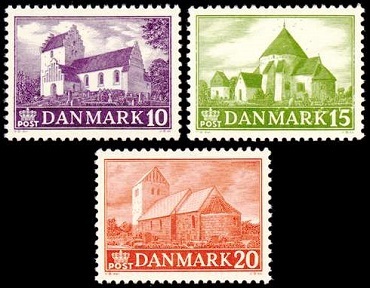 #290-292) were issued during September 1944 to honor Historical Danish Churches. The three designs are as follows. 10 Ø. -- Ejby Church. A 12th Century Romanesque church in Ejby, Zealand, Denmark. 15 Ø. -- Østerlars Church. A 12th Century Romanesque church in Østerlars in Gudhjem, Bornhelm, Denmark. 20 Ø. -- Hvidbjerg Church. A 13th Century Gothic church in Thyholm, Denmark. The three portrait stamps shown above (Sc. #294-296) were issued on September 26, 1945 to celebrate the 75th Birthday of King Christian X. The overprinted 10 Ø. denomination stamp shown above (Sc. #257) was issued on September 17, 1937 to publicize the Jubilee Philatelic Exhibition of the Copenhagen Philatelic Club on their 50th Anniversary. The stamps were only available for sale at the exhibition, with the purchase of an admission ticket. The 15 Ø. denomination stamp shown above (Sc. #262) was issued on June 20, 1938 to commemorate the 150th Anniversary of the Abolition of Serfdom in Denmark. The design features the Emancipation Column in Copenhagen. The 10 Ø. denomination stamp shown above (Sc. #288) was issued on November 27, 1942 to commemorate the 300th Anniversary of the Round Tower in Copenhagen. The Round Tower was built in the 17th Century for use as an astronomical observatory. The 20 Ø. denomination stamp shown above (Sc. #289) was issued on October 29, 1943 to commemorate the 25th Anniversary of the Danish Aviation Company. The 20 Ø. denomination stamp shown above (Sc. #293) was issued on September 25, 1944 to celebrate the 300th Anniversary of the Birth of Ole Roemer, the Danish astronomer.